Moscow in Movement examines how citizens and state power interact in post-Soviet Russia. 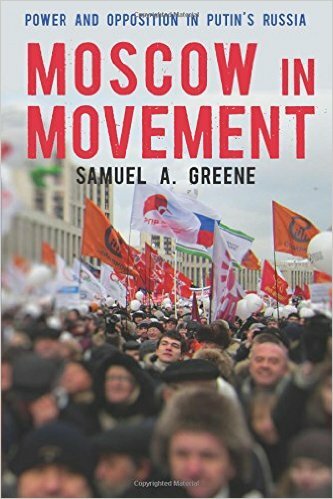 Samuel A. Greene, director of the Russia Institute at King’s College London, looks at the lived experiences of Russians and considers several case studies carefully to show how individual Russians, elements of Russian society, and representatives of the Russian state form their relationships. In the end, Greene is asking similar questions to those posed by Authoritarian Russia: How does Russia work, why is it that way, and what does that mean in a larger sense? Where Gel’man took basically a top-down approach, Greene takes mostly a bottom-up approach, looking at elements of Russian civil society as well as individual interactions with the state. Greene’s book, published by Stanford University Press, is an academic treatise, with its attendant strengths and weaknesses from the non-academic reader’s point of view. This is not to say that it is dry or overly long; far from it, the main text is less than 250 pages, and the narratives that support the analysis are vivid and true to life. The strengths of the book as an element in academic discourse include a strong theoretical basis for the groups Greene chooses to analyze, a clear argument about the meaning of the events he relates, and careful documentation of his work, so that interested readers can check or learn more. The weaknesses, from my point of view, include an overly long chapter on theories of civil society, a long time lag between the events described and the book’s publication, and a nagging suspicion that the chapters were written for other uses and then stitched together to make a book. (This last is a structural issue by no means limited to Greene’s work. Fritz Stern’s justly famous and groundbreaking Gold and Iron, for example, has a long chapter on Balkan railroad financing that was plainly written to stand alone.) As a counterpoint to claims that Russians are innately passive in the face of state corruption, the book is invaluable, and as an description of social change at the personal level, it is incisive. Greene’s core argument is that power in Russia is a “club good,” available to members of the club for their own use and guarded from non-members. How do people react to such a setup? “Faced with a disengaged elite, civic disengagement is a rational response. But we should understand that disengagement to be circumstantial and contingent, rather than cultural and absolute.” (p. 10) The way that Russians react to their circumstances, Greene argues, are neither mysterious nor immutable. An understanding of Russian culture and history is certainly helpful, especially as a means of seeing how institutional choices have shaped the civic space in which citizens life, but that same history also shows how ordinary Russians have acted to press their claims on the state. Greene examines cases where interaction with the state was inevitable—for people beaten by police, for example—or where citizens worked together to stop state action or retain benefits. Examining their cases over a number of years, Greene sees some success in individual cases, including criminal convictions of some officers. On the whole, though, monetary compensation is extremely slow to arrive when it is awarded, and the sums are often only nominal. Further, the law-enforcement agencies are too decentralized for anything like systemic progress to be made. The state, as noted above, does not engage with citizens; in this case, it is a problem at once too prevalent and yet too diffuse to solve. Finally, Greene looks at an internet-driven protest movement that arose very quickly in 2006 and achieved surprising reversals in state policy. The group, Svoboda Vybora “referring to the freedom to choose what kind of car to drive” (p. 171) began with plans to protest a decision to ban cars with right-hand drive from Russia’s roads. This would pose a particular problem in Russia’s far east, where many cars are imported from Japan. The ban would have affected between 1.5 million and 2 million cars. Drivers found each other via the internet and decided to launch a rolling protest, with honking horns and flashing lights. The government withdrew the ban in the face of popular opposition. Because the group was internet-based, Greene could read the messages participants exchanged and see how a social movement developed. After the initial successes, organizers and members faced choices of how to proceed. Greene details further actions by Svoboda Vybora, documenting internal debates, as well as the authorities’ reactions. He shows splits in the group, and efforts to co-opt organizers into existing structures of power. “The Russian automotive rebellion, one of an exceedingly small number of civil society organizations in Russia capable of mobilizing true grassroots support and of putting effective pressure on the state, began as a protest by motorists afraid of having their cars taken away from them and grew into a social movement fighting for government accountability, equal rights, and the limiting of elite privilege.” (p. 200) One thing led to another, a conclusion important for the development of civil society in Russia, and for its future prospects. to underscore the importance of understanding authoritarianism as a lived social experience rather than as an aggregation of marcolevel conditions and structures. … A focus on the microlevel likewise helps us understand change over time. … [W]e can add the evidence presented in this volume, and we arrive at a picture of a society that is developing, tentatively, its own “organizational ecology,” independent of the mobilitzational strategies of the regime and the elite. Elections for the next Russian parliament will be held on September 18, 2016.